The PJ Premier Saddle offers features of the PJ Original at a more affordable price. The Premier has knee rolls and blocks to provide the rider security without restriction. Handcrafted from high quality, naturally tanned French leather on a revolutionary polypropylene tree. The leather is very durable and supple. Foam flocked. A favorite for hunters, jumpers or equitation. 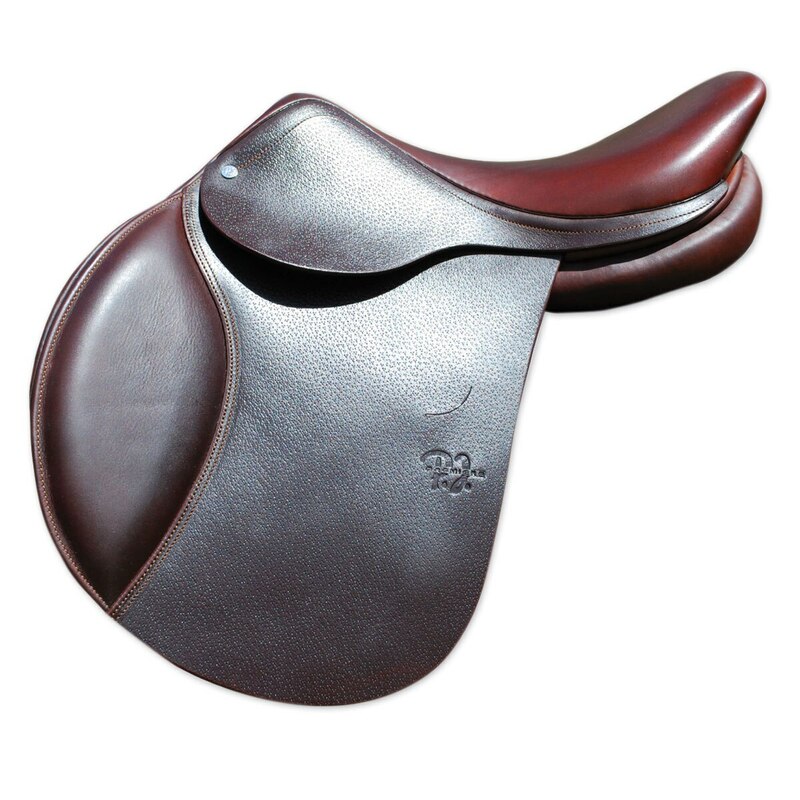 Available in sizes 15" - 18"
PJ Premier Saddle is rated 4.8 out of 5 by 14. Rated 5 out of 5 by Lookingup from Comfortable and fits so many different horses I do not own my own horse, and was having issues finding a saddle that could fit the variety of hunters I ride. PJ Premier is the answer. Fit the quarter horse, the high-withered Thoroughbred, and the 14.2 pony all very well. I can’t explain it. We all think this model is magical. ;) It puts me in a good position, is grippy, and comfortable. I have a long femur but the fit is good too. Very happy. Rated 4 out of 5 by Tory from Beautiful but narrow The saddle was beautiful. Unfortunately it looked like a pimple on the back of my 16' 2" TB who is built like a warm blood and quite broad. I don't know if my horse is oddly broad or if the saddle runs a bit narrow (I tried a medium tree). Regardless there were several inches between his spine and the saddle. Rated 5 out of 5 by Cali girl from Great saddle I am new to riding (2ish years) and after talking with my instructor, she said it was time for a saddle of my very own! After talking with her about different type, sizes, and doing a lot of research. I settle on this beauty here. I tried a lot of other saddles before getting this one. I LOVE it so much. It is so comfortable with no real break in period. I have worked really hard to get the leather soft using oils and conditioners. It is so great and I think it will last, as it is a quality made product. I have had multiple people at the barn try it, just because, and they all have nothing but great things to say. For the budget I had this is perfect. I love it better than some of the other girl's Antares saddles. Give it a try and you will not be disappointed. I wanna say I have had this for 6 months now and I would purchase this saddle again. Rated 4 out of 5 by Jan k from Nice at this price point I did not keep the saddle. That being said, I thought the saddle was fairly comfortable, (not as comfy as the PJ Pro), and fit my high withered OTTB well. I was so happy to be able to do the test ride. I would have loved to have purchased the test saddle at a better price (the saddle was in used condition), but was told they don't do that. Thanks again SmartPak for the wonderful customer service. Rated 5 out of 5 by horses n stuff from Awesome Saddle! I did the test ride. Love this saddle from minute one. Like it so much, ordered the PJ Original test ride too. The saddles are exactly the same. I guess different leather but really no difference. So for this super bargain price you can get a nice PJ! Can't recommend this one enough. Feels as though you're secure in the saddle (knees and rear blocks fit like a comfortable glove) as compared to others I've ridden in like Antares or Pessoa. Rated 5 out of 5 by ChrissieD from Great value for the money! Bought this saddle for my daughter's TB after months of searching. Comfortable, quality and nice looking saddle. Comes with a really nice cover too! Rated 5 out of 5 by Alina from Awesome Saddle I bought this saddle a few months ago and it has been absolutely wonderful. The leather is grippy and didn't take long to break in. I ordered the saddle in a wide as I have a big-bodied horse and it fits him wonderfully. If you are looking for an expensive looking/well fitting saddle I recommend this. It is affordable and a great purchase. Rated 5 out of 5 by Zena25 from Good Saddle We just got the trial saddle to see if it would fit our horse and how it would feel. We liked the saddle and the fit but it was too small for my daughter. Unfortunately, this style of PJ does not come in the size she needed but if it did we would certainly purchase it. It was very comfortable and fit our broader horse. Rated 5 out of 5 by Anya from Awesome saddle! What a great saddle! I got mine lightly used and it has been wonderful. I was searching for a saddle that fit the same as a more exspnsive French saddle but no saddles in my price range were working until I found this. Very comfy, stable and well blanced. The leather is incredibly soft and grippy but doesn't scratch too easily either. I event and this saddle works wonderfully for both cross country and show jumping. It also fit my medium wide, thouroughbred mare very well. I had the saddle fitter out to check the other day and he said that it was perfect. I also feel very close to my mare when I'm riding in this saddle. Rated 5 out of 5 by Anne from love my new saddle I love my new saddle. It fits my horse's high withers and it seems he is moving better. I also think my position is better and it is so soft and comfortable.